“Tony, help me. You have to help me build an effective team. We are not performing as we should be and I need help to lead them to where we need to go. The team is struggling and I need to lead them better.” This is a common scenario I hear from managers at all levels. The influx of team building activities are increasing, and often they fall short in effectiveness. 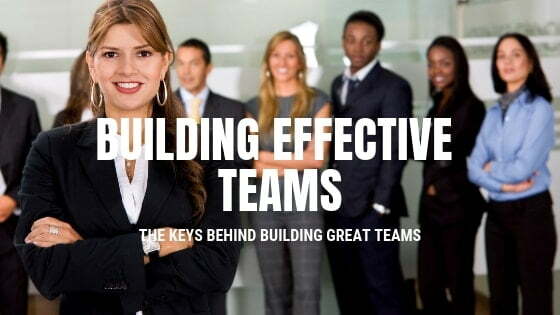 They build a warm and fuzzy feeling on the day, but if they fall short on addressing the critical daily behaviours within the team, they will not succeed in the long term. Often we illustrate team behaviours using sporting analogies for comparison. While not everyone is into sports, the vision behind using sporting teams is sound especially using high profile, visible teams. They can be documented and researched. When a team is performing poorly there are usually tell tale signs of poor team cohesion. People operate as individuals. You see players more concerned with their own performance or statistics, than the achievement of team goals. Self-preservation is key and people put in the effort so finger cannot be pointed at them. Effort is seen, but that extra effort is missing. The team operates at surface level and goes through the motions. Trust is spoken of but rarely displayed and never felt. Individuals have expectations of others, but excuse themselves. The issue is always someone else’s fault and excuses, blame and denial are ever-present within the team. Their is fracture and division within the team. Cliques may exist in the team and these smaller teams create fracture and misalignment. This is seen and felt, but never spoken about, at least not publicly. There is water cooler talk and hushed whispers, but on the surface ripples are seen and felt but without open and honest discussion to correct them. There is confusion on team roles and strengths and this leads to people playing in positions unsuited for them. The team strengths have been nullified with people not playing to potential and in their best suited position. Using what we see in our understanding of poor performing teams, allows us to set the framework for a high performing team. This framework is seen in high performing sporting teams and we can apply them to corporate teams, large and small and at every level. Simplicity it may be seen that we do the converse of those traits seen in poor performing teams, but this is where leadership comes into play. It requires intentional investment, clear direction and dedicated behaviours. Often that is the reason why we don’t see better performance in our teams. Leaders don’t invest and are not intentional in their approach. High performing teams have the following traits. They have a purpose. They have a reason for being and every member of the team has bought into it. The team has a purpose, a goal and a vision for what great looks like. Importantly, team members appreciate that team goals outweigh over individual goals. The satisfaction of good individual performance is diminished if the team goals haven’t been met. The team has deep levels of trust within each other. They trust each other to perform for each other and this trust leads to open and vibrant discussions when needed. The trust builds a capacity for team members to share opinions, thoughts and ideas openly, providing the opportunity to set direction with each team member feeling they have had input and been listened to. The team sets standards and each individual accepts personal accountability for these standards. The team self-manages the behaviours and expectations driving performance autonomously. Cliques are not allowed to exist. The team may have multiple teams, but they operate for the benefit of the entire team goal. They know their role and they play their part in the achievement of the overall goal and vision. Each team member plays to their strengths and maximizes their performance in their specific role. They have “bought” into the team and perform to their highest to give the team the best opportunity. Team building is not a quick fix, adventure ropes course day. Unfortunately that is often what is has become. Leaders searching for that program that stretches their team out of their comfort zone. These days are effective for doing that, but unless the team returns to the workforce with the same ideals of stretching themselves out of comfort, these days often fail. It’s the daily behaviours of courageous leaders that breed the culture and the environment that build an effective team.